For the next year, Elder Wilson Bearhead will spend his weekdays in Edmonton Public Library branches and it’s something he is looking forward to. “I get to just sit around and talk with people for now because we’re just in the beginning stage. Once we develop the community and what the community wants, then we’ll go in that direction as well,” said Bearhead. He was named as the library’s first Elder in Residence, and his appointment was celebrated on April 7. Bearhead, from the Paul First Nation, says talking is important, for both non-Indigenous and Indigenous patrons. His presence will help reconnect Indigenous peoples to their culture and language, as he will facilitate sharing circles, smudging ceremonies and traditional teachings discussions. And he will serve as a cultural bridge for non-Indigenous peoples, listening to their stories and learning as well. “For many years we were told there was a difference, but there’s not a difference because each and every one of us, we speak the same language now. The heart inside us beats, as well, in the same way. “We need to get together and talk about one of the truths of how we can help each other and engage in a better relationship moving forward,” said Bearhead. 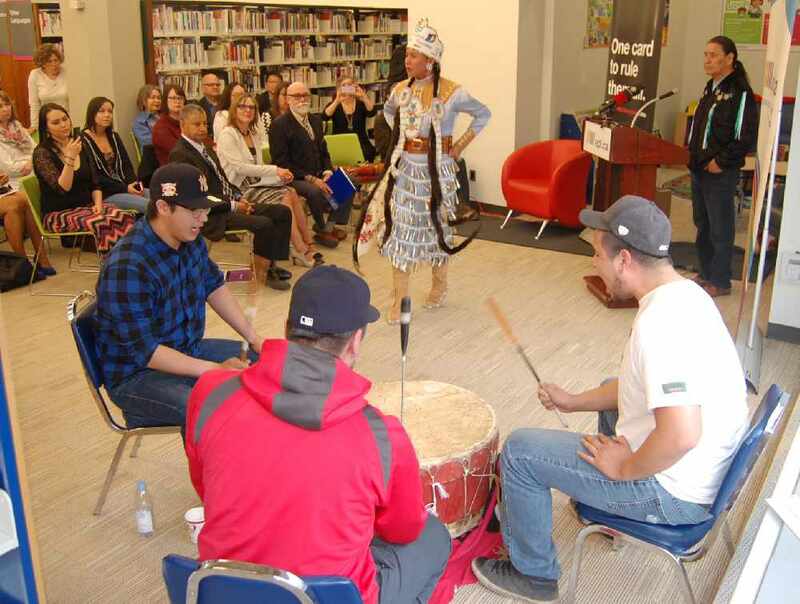 It’s this “better relationship” that has spurred the Edmonton Public Library to take this latest step in its effort to address reconciliation, as laid out by the Truth and Reconciliation Commission in its 94 calls to action. In 2016, the library began its Exploring Reconciliation Series. “(Elder Bearhead is) so non-judging and embraces people as human beings and I think if we can spread his attitude and his perspective to others, that would be a major benefit for our city and Edmontonians,” said CEO Pilar Martinez. Martinez firmly said non-Indigenous people want to understand their Indigenous counterparts and she believes that Bearhead’s “generosity of spirit” makes him easily approachable. “What you say is important. But what you do is even more important,” said Bearhead. He believes everybody has to chart their own paths forward, particularly adults, and plan the actions they need to take in order to build reconciliation. “We are the people that younger people are going to watch. If they see us walk in a positive way in a direction that is meaningful, in a direction that’s very beneficial in many ways, the young people are going to want that. We’ve got to give that positive demonstration of what life could be in regards to what we do, the positive things that we do,” he said. Bearhead stresses that his positive step forward is to take on the position of Elder in Residence for the library. “It’s one step to reconciliation, but it’s also an important step for Indigenous peoples because, as you all know and I know, we haven’t been given an opportunity for many, many years and here’s an opportunity,” he said. “We have to collaborate and communicate and build community together and I think that’s the spirit he brings,” she said. At this point, he will be splitting his time between the temporarily relocated Stanley A. Milner branch in downtown Edmonton and the Abottsfield branch in north Edmonton.